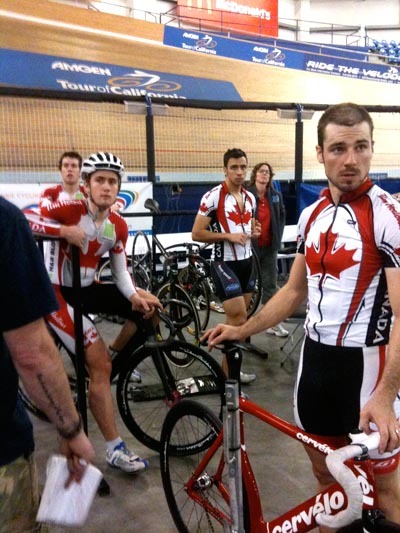 The Canadian Track team is back in Los Angeles for a training camp to prepare for the upcoming World Cup in Beijing, China (January 22-24). Some of the team, including all but one of the sprinters, arrived early to take advantage of the warm weather and the Home Depot Center Velodrome. The only training session sprinters Stephane Cossette and Joseph Veloce could get into their first night was a Madison session, “so we figured, what the heck, lets go have some fun. Well, that was my plan at least, just to spin the legs and loosen them up from the travel the day before,” explained Veloce. Zach Bell, Tara Whitten, and Julia Bradley also arrived earlier, with Julia welcomed into the American women’s team pursuit camp. Coming from an Ontario winter it was a welcome change to get on track and train with a group. Monique Sullivan, the only Canadian female sprinter at the camp worked with some of the American male sprinters that were asked to join their neighbours to the north. She posted some quick times and is riding strong.